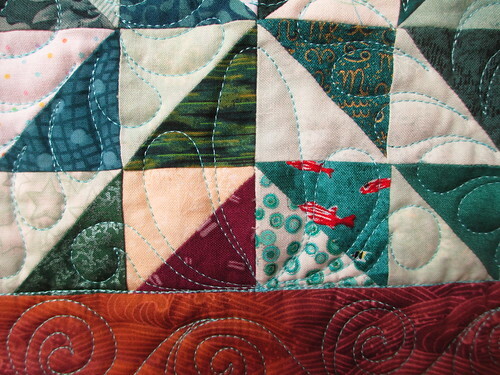 I completed the long-arm quilting and binding of the “Ocean Waves Journey” quilt! 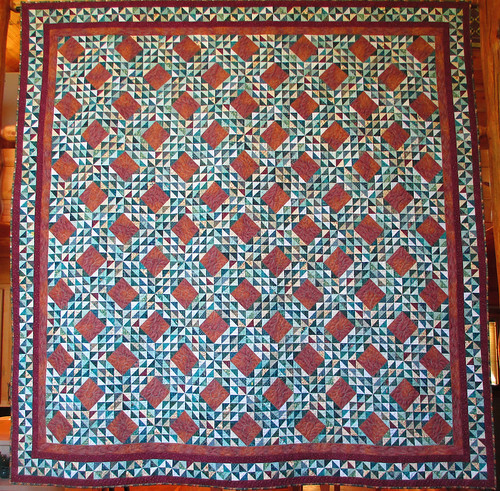 The quilt finished at about 101 inches square. I used around 3400 yards of thread which my dear son-in-law pointed out is about 2 miles of thread! 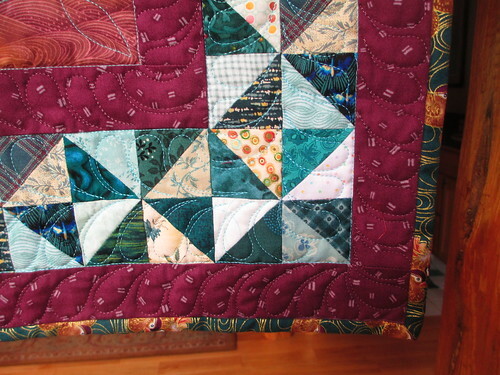 I used two colors of Fil Tec Glide thread, turquoise and plum. The batting is Hobbs 80/20. 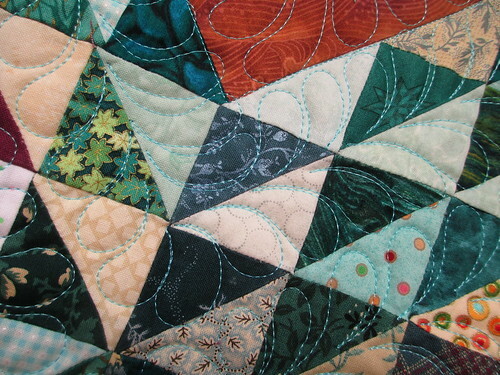 I collected 34 dark teal fat quarters and 34 light fat quarters to construct the half square triangles in the quilt. I counted 4900 triangles, but if you want to check that out yourself, let me know if you arrive at a different total. 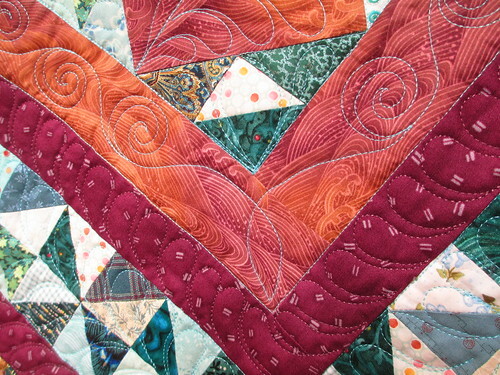 Click here and here for earlier posts about this quilt. 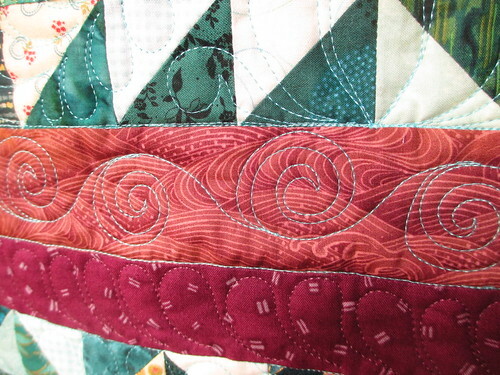 This entry was posted in My Long Ocean Waves Journey, Quilting. Bookmark the permalink. 3 Responses to “Ocean Waves Journey” Completed! Joyce, absolutely beautiful. 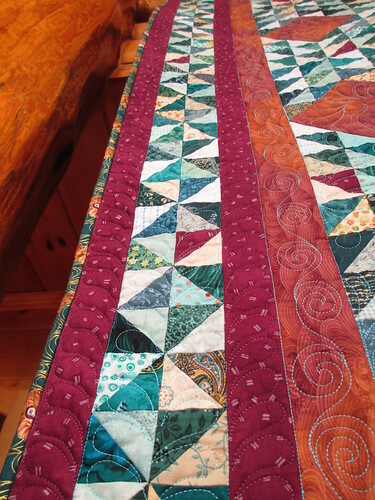 The quilting is so perfect for all the various sections – and the colors are wonderful too. Be sure to send it along to Bonnie Hunter!! Love Ocean Waves. 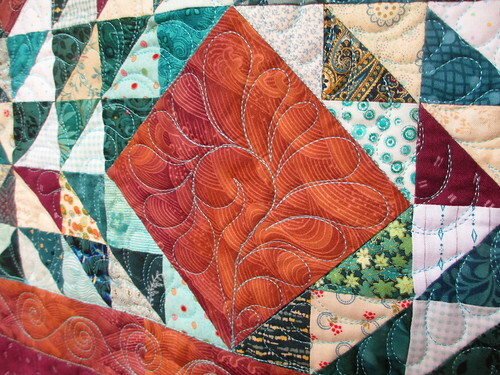 Beautiful quilt Joyce. Oh my, it’s just wonderful. I’m working on that one myself. 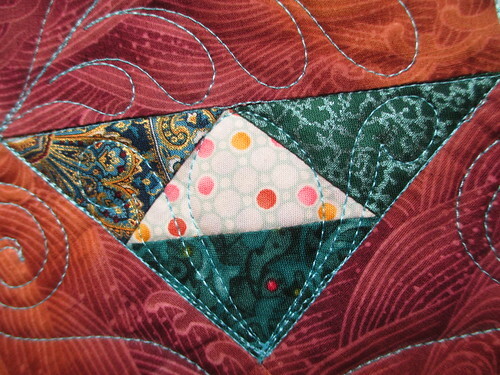 I’ve finished the Block A & B and am working on the half blocks. Still quite a ways to go. So nice to see it’s actually capable of being finished. Maybe by year end. Yours is gorgeous and congratulations on a spectacular finish.